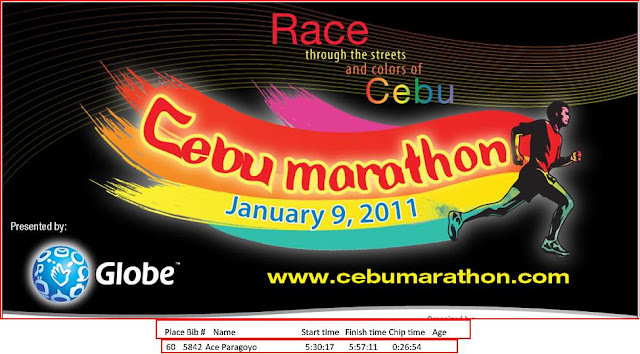 My main agenda for this trip is to join the Cebu Marathon 2011. I registered at Planet Sports in Power Plant Mall last October 18, 2011. Right after I registered, I searched for a cheap airfare online and booked it. A month before my Cebu and Bohol trip, I’ve already planned for the whole tour including my accommodation which was for 3 nights (cost: 900 pesos) at Sugbutel and booked boat ride from Cebu to Bohol (vice versa) for January 10. The day has finally arrived, I was all set and prepared for my trip. I prepared all the things I need and then went to the airport. After an hour plane ride, we reached our destination. Their airport is as big as the one in Davao (they may have international flight). I got my things then hailed a taxi from the airport to Sugbutel, I’ve decided to take the yellow cab rather than the normal taxi because of the very long line of people. After 30 minutes of a cab ride, Alas, I’ve reached the hotel. I’ve arranged my things before touring around the city. At the City, I went to Ayala Center to pick-up my race kit for the Cebu Marathon. I’ve decided to eat at Ayala Center for my lunch (Luz Inasal). While inside the mall, I saw an exhibit of different kinds of Sto. Nino, I took it as a chance to take photos. I've also tried getting a tour package for tomorrow after my marathon, but the price of the tour is quite expensive for one person. I got tired walking around the mall so I’ve decided to go to Regency Hotel and avail their package for Skywalk and Edge Coaster (includes a free t-shirt and snacks). I’m very excited and a little bit nervous at the same time. I guess it’s normal for a first timer like me. I’m assigned to join a group of family and a pair of lovers on the Skywalk. We were ushered to the 37th floor of the hotel. Our photos are being taken by their official photographer. They have rules that guest/s are not allowed to take photos using their own cameras. Only the official photographers are allowed to do so. But for you to get a copy of photos you need to purchase it for 230 pesos each. After the Skywalk, I went to the 38th floor to try the Edge Coaster, same rules (no cameras allowed). I’m riding on the edge coaster while circulating around (whew! I’m quite afraid). I don’t know if you can consider this as extreme sports but for me it is. I went down to the 19th floor to grab my free snacks and also get my photos. Overall the price for the package is 750 pesos. After that, I went to Shamrock store to buy their famous otap. I decided to go back to SM Cebu to search for a cheap price city tour. This time, I rented a PC at Netopia and surfed for 30 minutes. Before going back to the hotel I ate dinner first at SM City Cebu food court. After dinner, I decided to have an early rest, preparation of my marathon the next day. I woke up early, suited up for my race and headed to where the marathon took place. Upon hearing the gunshot, the race started. I’ve finished 5KM run with a 27 minutes mark, a good personal record for a newbie runner like me. After the race, I’ve got my freebies and cool down for a bit before heading back to the hotel. Earlier before the race, I've contacted a number that I've got from the internet to inquire about their city tour package. Good thing they have an available driver to accommodate me for the 9:30 AM tour. So the minute I got back to the hotel, I called them again to ask for updates. They confirmed that the driver will pick me up at exactly 9:30 AM for the tour. Indeed, by the time the clock reach 9:30 AM the driver came up. And so our tour began. We visited all the tourist spot within the city for 4 hours only, including the time we ate for lunch. We also bought dried mangos at 7D factory. Overall the cost for my city tour is 1150 pesos (900 pesos for 3 hours then plus 250 pesos for the next hour - maximum of 4 persons/ car). After the driver drops me off back to the hotel, I took a 2 hours rest before heading to a place called Larsian sa Fuente, you can see lots of barbecue stalls here. They’re open from 4 PM till 5 AM. I ate different kinds of barbecue, the food taste really good I must say. After my so-called “food trips”, I went to SM City Cebu, bought dessert and decided to tour around the mall. After almost 3 hours, I’ve decided to head back to the hotel and take a rest. Woke up around 6:30 AM and prepared things for my one day Bohol Trip. I went to Pier 4 and bought tickets/tours at Supercat for 2800 pesos (includes round trip tickets also). After 1-hour boat ride we reached Bohol, our tour guide is already waiting for us. I’m really excited to see the famous Chocolate Hills. The tour started around the city of Bohol to see the popular tourist spot. After our city tour in Bohol, we went to pier going back to Cebu. I'm back to Cebu then I plan to eat for dinner in Mcdo. This is my last day in Cebu. I woke up around 9 am and prepared all my things. My check out time is 12 noon but my scheduled flight is around 7pm. Having so much time left before my departure, I decided to go around the city while waiting for my 7pm flight. I deposited my luggage at the hotel lobby, planning to pick it up after touring around. 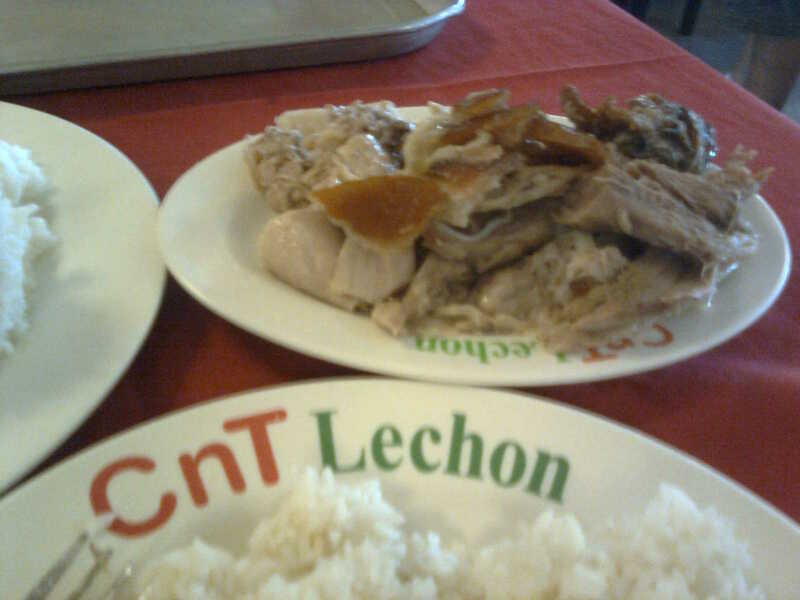 I went to CNT Lechon, a place where you can eat the popular Cebu Lechon. I ordered half a kilo of Cebu Lechon for lunch. I’m starving and I felt like I could finish it, all by myself, but of course I was wrong. Nonetheless, I decided to buy another half kilo of lechon for takeout together with my leftover lechon as pasalubong. I’m used to “sarsa” like mang tomas as a sauce, but with soy sauce and vinegar, I was really amazed. It is not a common sauce for many of us. After that, I decided to go to SM to buy souvenir shirts. I still have some few hours before my flight so I just walked around the mall trying to kill time. I went back to the hotel to pick my luggage before heading to the airport to catch my flight back to Manila. 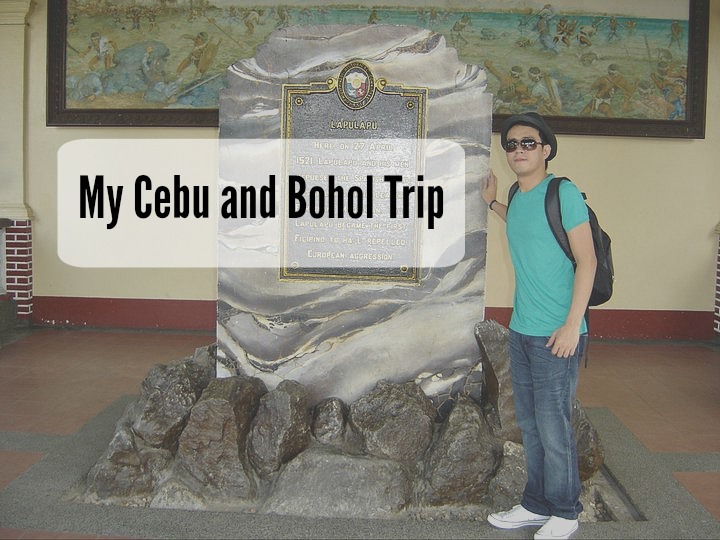 My Bohol and Cebu trip were a blast. I really had a great time. I’ve met new people in my Bohol trip, a couple namely Jack and Rose (Jack is an American citizen and Rose is a true blood pinay). I also enjoy eating foods and seeing the popular places within the City. I would love to go for island hopping, once I got a chance to come back again. If you’re planning to go to Cebu and explore the City, you can contact Mr. Aldrin (09153978421) and to Bohol, you can book your one day tour at Supercat (try to search from the internet). Thanks for visiting my blog site! This is where I'm keeping all my stuff from now on, so come back whenever you want to see what's new. Feel free to post a reply if you see something you like or just want to get in touch. if you visit a beautiful place and you don't have enough time to explore more. you will probably wanted to go back. i love Cebu. How much was your overall budget for the Cebu-Bohol Trip? Thanks for sharing the pictures and your adventure. that time, I think my budget including airfare is five to six thousand pesos. What an awesome solo trip! Full packed! BEST BUY : Where to buy Pasalubong (present) in Cebu City Philippines? NEWS ALERT: ASUS Philippines just finished their three-part workshop series, which focuses on empowering and giving people necessary tips and aids for their life passions they want to pursue.